Cloud computing and big data company Pivotal has opened its new European headquarters in London's Tech City area, bringing along with it £100 million investment in the process. The company said that the sum, which will be invested in the next 10 years, will be used to employ 75 staff in January 2014, including a number of data scientists acquired through engineering initiatives and community groups. 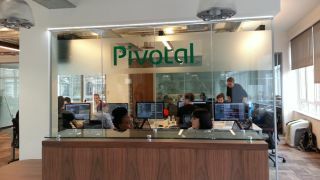 It will also be used to set up its new Shoreditch-based office and help grow Pivotal's customer base across the region. EMC, which acquired San Francisco-based consulting firm Pivotal Labs in 2012, spun out Pivotal as a new start-up in April 2013, appointing former Microsoft exec and VMware CEO Paul Maritz at the helm. Pivotal pitches itself as a "company at the intersection of big data, platform-as-a-service (PaaS) and agile development" that lets organisations build applications that use big data on a single, cloud independent platform. It was formed along with VMware and General Electric, which are using its platform to develop cloud-based big data applications. Speaking at the launch of the new headquarters, Maritz said: "Let's assume that infrastructure-level clouds such as Amazon and Openstack become the mainframes of the 21st century, and that the concept of providing infrastructure for a new generation of cloud apps is that you're not tied to any one cloud. "That's where we think the industry needs to go and we're placing our bets on that. However, we believe that infrastructure is not enough and that we need to work closely with customers as they have to learn how to use these techniques very rapidly." He added: "London is the place where younger people want to live and work, entering a new era of IT where enterprises want to gain many of the same capbilities and cultural attributes that consumer internet companies have pioneered and found ways of working at scale and velocity that most enterprises can't do." How can you use Hadoop in big data analysis?